Tianjin You Fa ambitious Precision Machinery Co., Ltd.
Industry：Mechantronics producing line, special thin wall sections, Rolling molding equipment, special machine tools and industry mould. 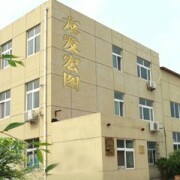 Tianjin Youfa Grandiosity Precision Machine Co. Ltd. is located in the Beichen Industry District in Tianjin. The company is founded in 1980s and it covers an area of 5000 m2 with 2600 m2 construction area. The registered capital is 2 million and the number of staff is 186. Youfa is a high tech private-owned enterprise. The main products of Youfa are Mechantronics producing line, special thin wall sections, Rolling molding equipment, special machine tools and industry mould. Youfa is capable of making all kind of non standard equipments. Also, we could design and manufacture all kinds of punch moulds. Currently, we have 18 senior engineers, 8 engineers and 10 technicians in machine, electric, hydraulic pressure and mould area. Locks of nine fold cabinet machine. Company：Tianjin You Fa ambitious Precision Machinery Co., Ltd.
Address：90th, Tiantong Path, Tianyun Road, city industry park, Tianmu town, Beichen district Tianjin.